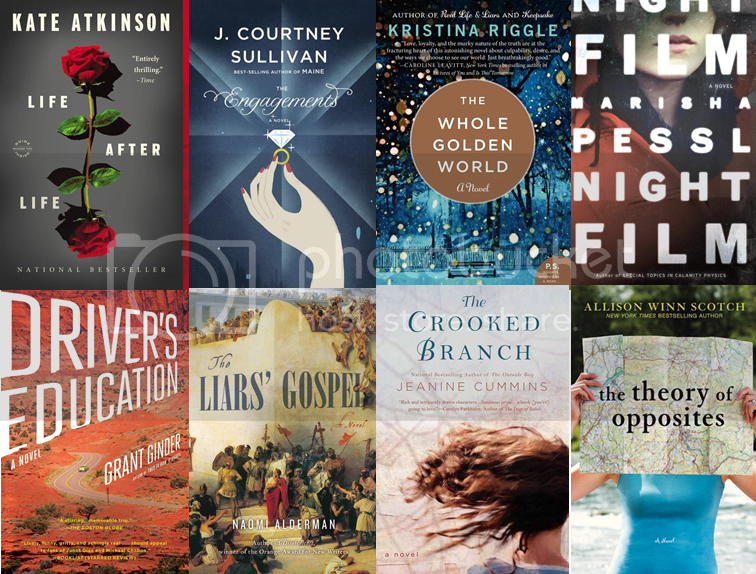 So, in the last quarter of 2013, it seemed a little like I might have accidentally quitting book blogging. There was a lot going on with that. For one thing, my motivation has been low ever since my blog was hacked over the 4th of July weekend. Honestly, some things still don’t work right. My WordPress stats can’t be accessed now (which is a little nice actually, not going to lie), I can’t use the link tool in my post editor to search for links within my blog, and pasting text from anywhere is a MINEFIELD because every curly apostrophe I fail to hunt down and remove will just ERASE the rest of the post when I try to save (and actually half of this post disappeared when I saved it despite the fact I had no links or text posted from anywhere else ARGH). Add to this the fact that I spend much of the day with three little children, two of whom would just loooove to bang on the keyboard, which means my computer lives up in my office, where I cannot get unless the littlest ones are asleep or in the care of someone else. I get a ton of stuff done on my phone and tablet but writing posts with any significant formatting (or really writing anything over a couple hundred words) is basically a no go. Fewer reviews, particularly formal reviews. You may get more of my responses to books and more responses to a group of books (such as cozy mysteries). I am not going to sit down and force a review just because I read a book, even if I did love it. If I don’t have anything to say, I’m probably not going to say anything. Sound Bytes is going monthly. I will have a monthly linky for January up tomorrow, and am planning to start hereafter on the first of every month. Being able to divorce the linky from a review will make sure that I actually put it up. Each linky will be up all month, so just link up and check out other people’s reviews whenever you can over the course of the month. I will be talking about other media I consume. Inspired partly by Pop Culture Happy Hour (which I will talk more about in the future), I am going to talk, or at least post, about other media I am consuming. I already have a post scheduled for next week about what is hanging out in my Netflix queue. Fitness has been a big part of my life over the last six months. First walking, then running and other workouts have actually taken up a lot of my potential blogging time. I’m doing a 10k training program now and hoping to run an 8k in March, so I may be spending some time talking about that here as well. There WILL still be book stuff here, don’t think because I’m talking about running and Netflix that I’m ditching the whole book thing, I’m just trying to change up what I’m doing so that I – and hopefully you – stay interested in the blog. Hopefully you’ll stick around as Devourer of Books changes and grows in the coming year. I know some of you think that I’m gone, but I’m not! At least not completely. I’m hoping to talk more over the next week about where I plan to take this blog in 2014 and beyond, but for now I want to wrap up 2013. 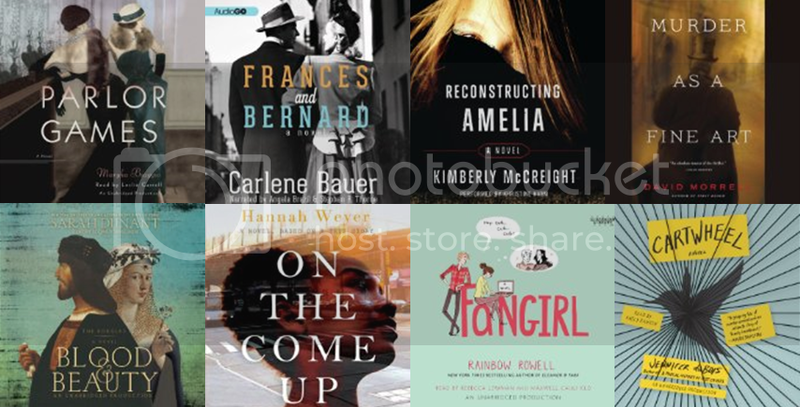 I can’t tell you how many books I read or how many were audio or anything because sometime in September I sort of stopped actually tracking what I was reading. Oops. It happened around the same time I stopped blogging so much, I’m not really sure what happened there, other than I went on a short trip and didn’t get back into the swing of things when I returned. I do know, though, that I did a whole lot of listening with all the walking, and then running, I did after I got my fitbit back in May (plus a bunch of yard work trying to get our landscaping in some semblance of order). Many of the non-audiobook picks below actually were audiobooks, including all of the nonfiction picks, but despite the fact they were well-narrated I specifically chose some of them for their contribution to the genre rather than their audio production. Many of the above books were provided to me for review. So, here’s the deal. 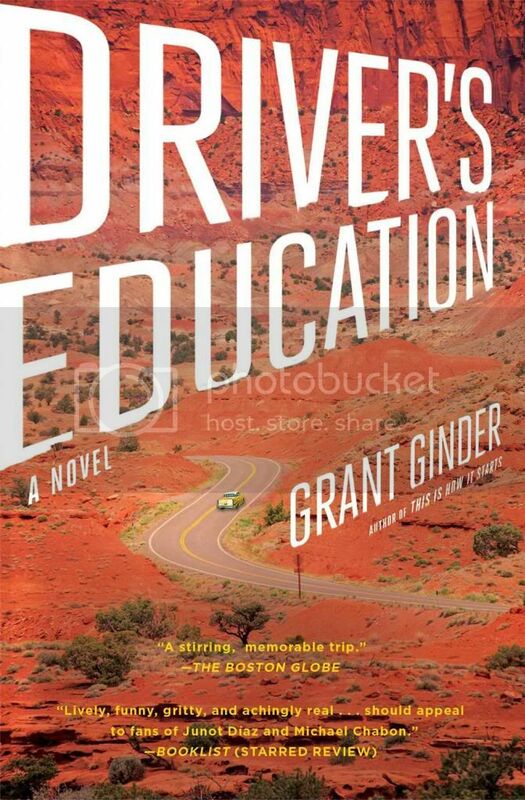 Back in January, this book Driver’s Education came out in hardcover, written by Grant Ginder a guy who was in pretty much half of all my classes in high school. We had far too much fun snarking with one another in the back of our French classes, so I was, understandable, I think, that I was SUPER NERVOUS about reading his book, in case it was terrible or something. I purposely didn’t take a review copy so nobody would know if I had it and would be looking for a review, and then I put off reading it for like 3 months because I was too nervous. I figured with my own copy, I could read it and just NEVER TALK ABOUT IT AGAIN if it was bad. The problem was, I read it in April and it was FABULOUS and one of the better books I read all year and I STILL didn’t ever write about it because I’m lame and basically a terrible friend from the past and blogger. Now the paperback is out and I am FINALLY rectifying the situation. FINN McPHEE EDITS A REALITY TV SHOW. His father, Colin, is a screenwriter. Both are adept at spinning fictions, a skill passed down to them by McPhee patriarch Alistair, whose wild yarns never failed to capture Finn’s youthful imagination – even as they cast a fragile veil over a past marked by devastating loss, unbearable love, and an incessant longing for a life whose heroic proportions could measure up to the breathtakingly vivid color of Alistair’s dreams. As Finn embarks on a road trip across America with his best friend, Randal, and a three-legged cat named Mrs. Dalloway in a last-chance bid to make his grandfather’s dreams come true, he will finally learn that the truth, though not always stranger than fiction, can sometimes make the best story of all. Here’s the thing. Ginder spins a great story, and the whole thing is wonderful. But I wasn’t expecting what he did with the ending and that took it from a solidly really good book to OMG, THIS IS GREAT YOU GUYS. So, I was really remiss in not telling you guys about this earlier because then it could have been on some of your best-of lists, but now you know so reeeeead it, please! Hey all! I know I’ve been sort of MIA around here and I will be writing more about that in the next couple of weeks, probably after the ‘best of’ post that I’m seriously hoping to get to. I know you all probably have NOTHING else to do without me around (yeah, I’m sure), so I want to help you fill your time and the hole my lack of blogging has left in your hearts. 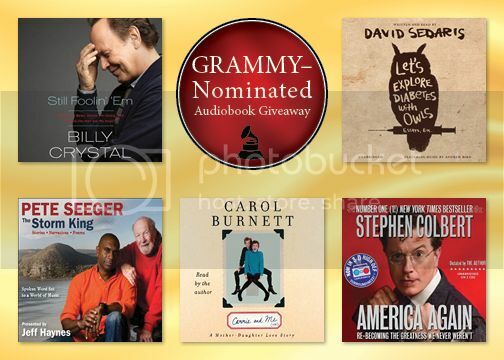 Enter Meg from Tandem Literary, the Audio Publishers Association, and the publishers whose audiobooks have been nominated for the Grammys. Just fill out the Google form below by 11:59 pm Central on Friday, December 20th. Please remember these are being shipped by the publishers, so some/most of them will probably not be to the winner until the new year.